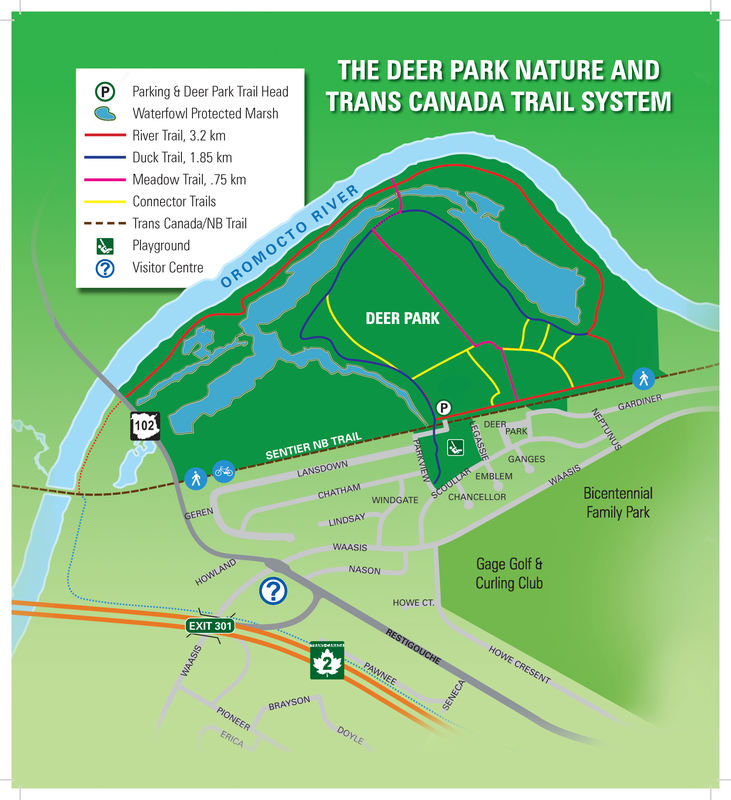 The Deer Park Nature and Trans Canada Trail System in Oromocto is available for walking, jogging, hiking, non-motorized biking/ wheeling, horseback riding, cross-country skiing and snow shoeing. The entire system is a relatively flat route. The system comprises four main trails, five shorter connector trails, and two trailhead system access points. The system access points include the Deer Park and Sir Douglas Hazen Park trailheads. Deer Park Trailhead From Waasis Road follow Scoullar Street to the Parkview and Deer Park signage. Located at the Deer Park Trailhead is a multi-use recreational area including a playground for children, parking area, and complete map of the trail system. The directions associated with the trail descriptions below are based upon entering the trail system from the Deer Park trailhead. Click here to download a pdf brochure. Sir Douglas Hazen Park Trailhead From Waasis Road take MacDonald Avenue to the central area of Town. Follow Onondaga Street to Sir Douglas Hazen Park and marina. River Trail (3.2 km) The River Trail begins at the Deer Park Trailhead parking area and runs Eastward to the Trans Canada Trail and wraps around the tip of the waterfowl marsh to the banks of the serene Oromocto River. Oromocto is Maliseet for ‘deep waters’. The trail eventually intersects with the Meadow Trail at the causeway. One can either continue along the trail or enter the Meadow Trail and return to the trailhead. Continuing along the River Trail under a canopy of mature trees you will have a view of the Oromocto River to the right and the Waterfowl Marsh on the left. Eventually the trail (under construction) will intersect with the Trans Canada Trail. Turn left here and you will return to the trailhead parking area. Duck Trail (1.85 km) This trail was named after its unique duck head appearance. The trail contains a great variety of local flora and fauna. As you travel along this section the Waterfowl Marsh will appear. As you approach the connector trail stay to the left to enjoy this beautiful marsh area. The trail will eventually intersect with the Meadow Trail. Here you can continue along the Duck Trail, turn left and cross the causeway to the River Trail, or follow the Meadow Trail back to the trailhead. Continue along the Duck Trail and you will have excellent views of the marsh and eventually you will reach the River Trail. Meadow Trail (0.75 km) To access this trail from the trailhead, continue Eastward along the River Trail to its intersection with the Meadow Trail. Turn left, continue along the trail and you will reach an intersection with the Duck Trail. Continue over the causeway to reach the River Trail. A left or right turn at this point will lead you along the River Trail and eventually return to the trailhead. Trans Canada Trail (1.35 km) From the trailhead the Oromocto section of the Trans Canada Trail will lead you in two directions. Follow the Northerly route to an intersection with the River Trail (1.35 km), at a point immediately prior to the old Canadian National Railway Bridge. The bridge has been reconfigured for pedestrian travel linking with the Lincoln and Fredericton Trails. A Southerly route will lead you into the central part of Oromocto (3.1 km), and the Hazen Park Trailhead. The Oromocto River will appear to your left, you will pass the Hazen Park Centre, historic Fort Hughes, and enter Sir Douglas Hazen Park. 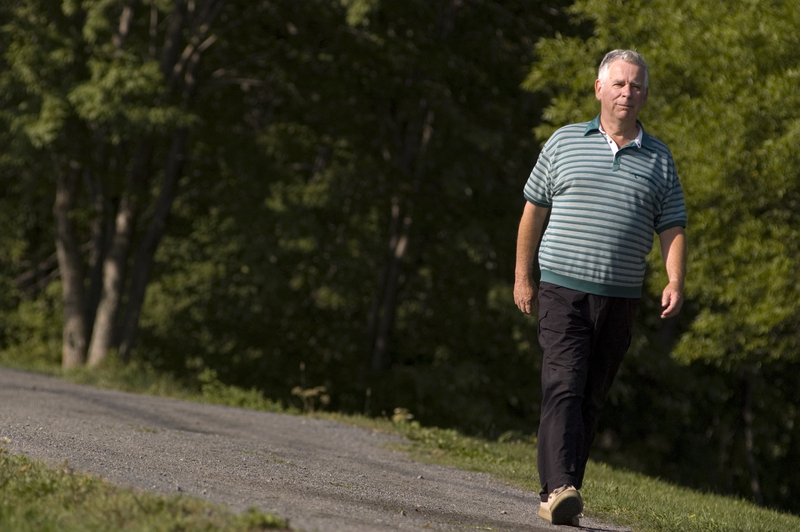 While in the park enjoy a picnic while viewing the Oromocto Marina and the junction of the Oromocto and Saint John River system, a short walk from the Oromocto Mall. As you continue you will eventually reach the high and low water wharf sites. These wharf sites were used in the extensive shipbuilding period of the late 1700 and 1800’s. Continuing along the trail will lead to the Oromocto First Nation prior to returning to the Deer Park Trailhead.